More than any other artist Gustave Baumann captured the essence of Santa Fe. He was born in Magdeburg, Germany in 1881 and when he was 10 years old his family moved to the U.S. At 17 he took night classes at the Art Institute of Chicago while working for an engraving house. He then went back to Germany in order to attend the Kunstgewerbe Schule in Munich where he learned wood carving and how to make wood block prints. He was attracted to New Mexico by the Taos Colony of artists where he had a number of friends and colleagues but decided that was not for him and settled in Santa Fe. Of particular interest to him here was the open door policy of the new art museum, which had opened in 1917, the year before Baumann arrived. There, artists were free to put up their works of art in the galleries. 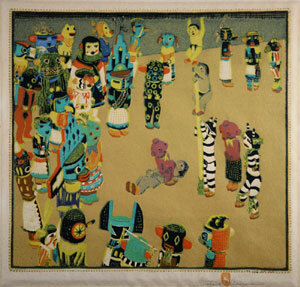 Baumann created in many media but his prints and puppets came to the fore and he is probably best known for the former. His works can be found not just in Southwest museums but in museums around the country and have become relatively pricey in recent years. His favorite subjects are the Southwest landscape and the Indians’ dances. Here are a couple of his prints as they relate to both. 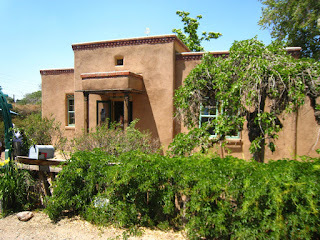 Just before leaving Santa Fe I had a rare opportunity to visit the artist’s home and studio. He built it in 1923 and it has been in private hands until recently. Two years ago the Historic Santa Fe Foundation took advantage of the opportunity to buy and restore the building as it was when Baumann lived and worked there, which he did until his death in 1971. Our visit began in what we might refer to today as an entry hall. It is about 10 feet wide and 15 feet long and was used as the shop from which the artist sold his work. 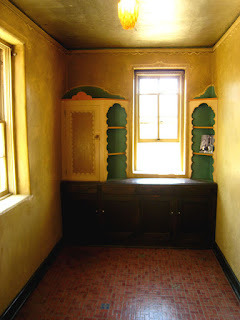 He painted a decorative frieze based on Indian designs and made nails part of the frieze. 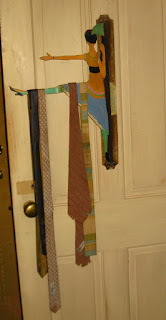 From these he could hang his pictures so that he never had to ruin the beautifully painted walls with additional nails. All the colors used in the house echo those used in his woodcuts. The little dining room off of the hall has the only original light fixture and the ceiling is in metallic paint, which was probably most helpful in reflecting the limited light that he got from his electric fixtures. We were ushered into a tiny space which was the hub of the house. It was lined with shelves that exhibited his collection of kachina dolls. Off of that was a small room made of cement and brick with a steel door which alone represented a good percentage of the building’s cost. This was his vault in where he kept his original wood blocks as well as finished works of art and important papers. Off of the hub we could also walk into Baumann’s private quarters where we saw his bedroom, as well as the bedroom added when his daughter was born. 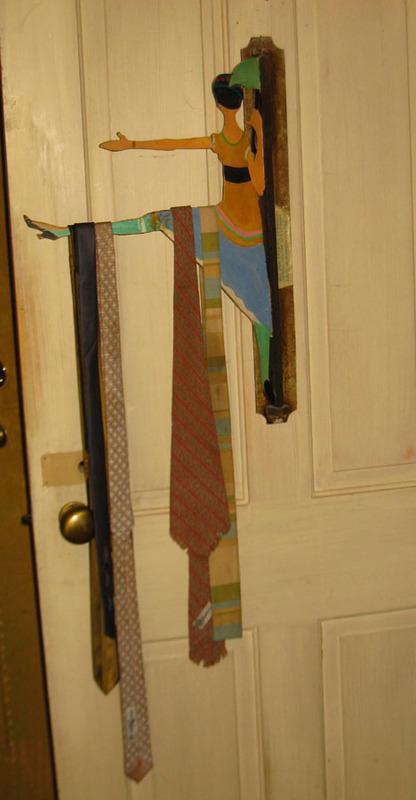 Note the tie rack he built into one of his closets… a Baumann puppet! 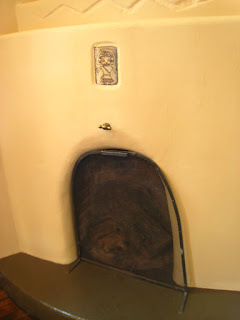 There are a number of Kiva fireplaces, which obviously needed to be used during the very cold winters. These are signature elements of Santa Fe architecture and they were often decorated. The one illustrated here has a plaque with a Katsina on it. As with many long-lived buildings, this house expanded. The large room with plenty of sunshine on one side of the house served as Baumann’s studio until he constructed an additional building on the back. The former studio then became his puppet theater where he entertained his friends with puppet shows. Like Calder’s Circus at the Whitney, the puppets are a beloved part of the collection of Bauman’s work at the New Mexico Museum of Art. While they have recently been restored and exhibited they are considered too fragile to perform. However, reproductions have been made and every Christmas they are featured in a puppet show at the museum to the delight of children and adults alike. Having just finished this missive I am reminded of two Baumann exhibitions here in Santa Fe. One which we received a preview of earlier this year is called “Gustave Baumann: Painter, Printmaker, and Puppeteer” and is currently showing at the Governor’s Gallery in the State Capitol. It runs until September 2. 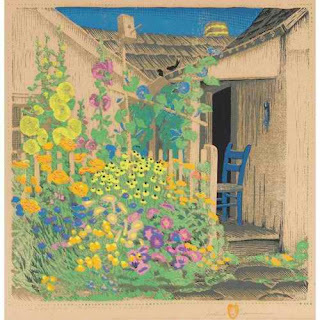 The other is just of the artist’s woodblock prints and will open at the New Mexico Art Museum on July 1 and runs through the end of the year.